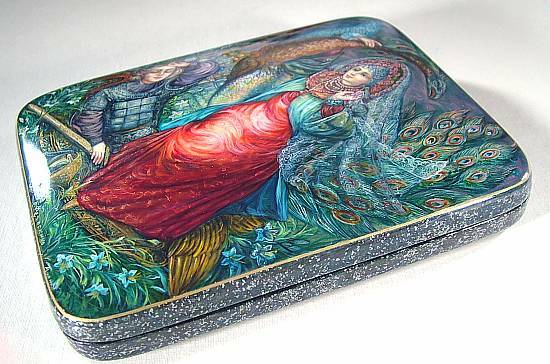 Painted with the great detail and majestic palette for which she is known, Fedoskino artist Maria Vagner brings us this fairytale-inspired box. 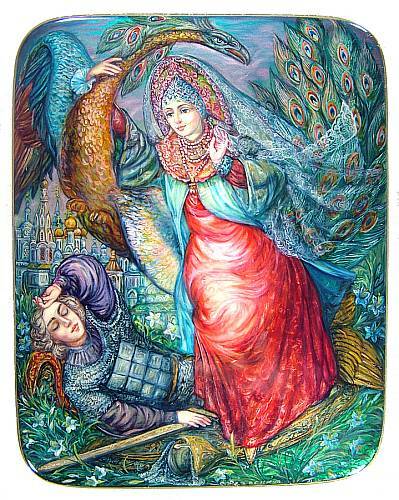 The firebird brings a fair maiden to her fallen soldier. While we are unsure which fairytale is depicted here, the face of the reunited lovers makes this a very attractive piece. Using mother-of-pearl and rich golds, blues, reds, and greens, Vagner creates a scene that seems to glow. 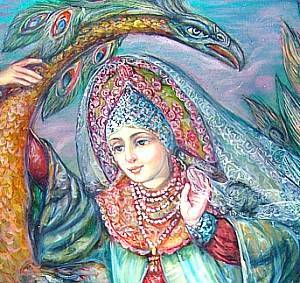 The firebird, with large, peacock-like feathers, is especially impressive. A castle in the distance and delicate flowers surrounding the solider complete this romantic picture. While Vagner usually creates a unique, new design for each box, this idea is very similar to a box she created in 2008, Fairy Tale Fantasy. There are some important distinctions between the two pieces, namely in the details. In this box, the background is less prominent, giving greater focus to the characters. The maiden's wardrobe has changed, and her face and expression are drastically different. The firebird even has greater plumage. The interior of this box, made from high quality papier mache, is red with a left hinge. The sides and bottom of the box are a speckled blue, and a bouquet of light blue flowers adorn the back. It is signed with the artist name and village.